After a $2.5 million refit, Sailing Yacht Ree is now available for charter. sailing yacht that offers the comfort and facilities comparable to a motor yacht in excess of 40 meters. Built in 1996 by Valdettaro Shipyard, Italy and designed specifically for luxury charters. 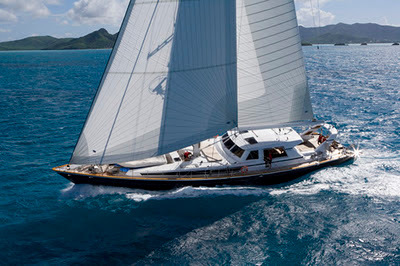 She is equipped with all the very latest technology, from state-of-the-art sail handling to worldwide communications. She is the perfect combination of power under sail and luxury, able to sail at 10-12 knots with ease. A superb sailing yacht that offers the ultimate experience for the most discerning sailors.